Back in my earliest school days, I had to develop a little category in my mind to classify certain forbidden food subjects, like Brussels sprouts. I always loved them because they reminded me of little Tom Thumb cabbages. One by one as I devoured them from my plate, I imagined these little heads of cabbage set out on bowls made of pearly shells in the middle of little peoples’ dinner tables constructed of spools and playing cards. I always asked for more. My very best friend was in another class. I only saw her during our recess time on the playground. One day, during one of our meetings by the jungle gym, talk went to Brussels sprouts. This beloved winter vegetable fell into a group of foods like liver, spinach, and asparagus for most of the group. My friend and I had enjoyed Brussels sprouts many times together, so I was prepared to team up with her and defend them. 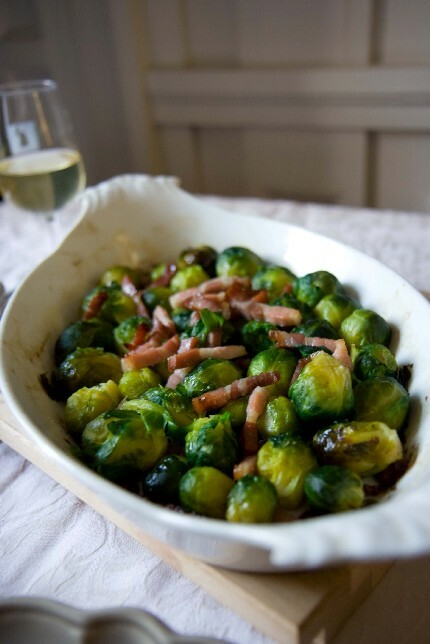 Before I had a chance to profess what I thought was our rebellious love for them and maybe start a club for Brussels sprouts lovers, my very best friend loudly proclaimed that she HATED them too – to a chorus of agreement from other children! So I just listened. She had a certain wisdom for a 6 year old, she knew in advance that there’s no convincing the playground Brussels sprouts haters. I watched them commiserate with a smile and wondered how other kids’ mothers cooked them. Brussels sprouts are now in their prime and will be with us fresh at the market until late winter. 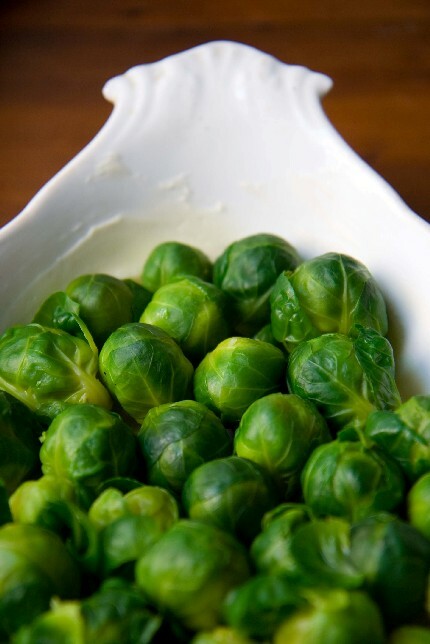 Now is the time to get your sight calibrated on what an ultra fresh Brussels sprout looks like – It is firm and green, and the freshest ones will have a clean white base where they’ve been cut from their stem, not brown or yellowed. The leaves won’t be loose or open, but closed tight like a nut. In France, the Brussels sprouts are smaller than what we find in the states, but they still taste the same. You can’t go wrong at the farmer’s market, where they should be fresh right now. The key to keeping the good flavor of Brussels sprouts is not to cook them too long. When they’ve been cooked too long, their color fades and they take on a stale bitter flavor. The foolproof way to cook Brussels sprouts is to wash them well, score the base with a cross-wise cut to help them cook more evenly, and parboil them for 5 minutes in salted water. They can be parboiled in advance, and kept until you're ready to bake them. Once they’ve come out of their hot water bath, place them stem side down into a dish that you have coated thickly with butter. They will absorb the butter in the hot oven from the bottom. Top with bacon, roasted chestnuts, or a simple mornay sauce, and protect them with a piece of baking paper. 15 minutes in a 350 degree oven and they'll be ready to take to the table. My favorite quick topping is bacon. These look wonderful, and I love your beautiful gratin dish! 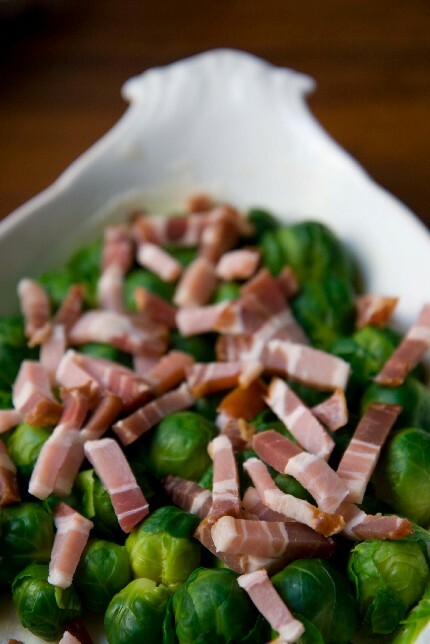 Your friend's desertion of the cause of brussels sprouts is one of those acts of childhood betrayal that stays with one! I like them with garlic breadcrumbs, and/or chestnuts, and/or lardons. Baking them is an interestin idea, the problem is room in the oven at Christmas. Who could ever resisit this vegetable! One of my most favorites .....need to try to prepare it this way!